I loved this book when I was a kid and my son loves it now. He thinks Ramona needs a spanking, and I am inclined to almost agree. Perhaps not quite a spanking, but certainly something stronger than, "You may go to your room." I think the mom gets stricter in later books in this series, but she is wishy-washy in this one.In a Battle of the Brats, my son couldn't decide whether Fudge or Ramona would win. I, however, thought Ramona the true champion. But she is hilarious. And actually, I started to admire her when she gives the excuse, "Because I wanted to see what would happen." Usually in books it is the boys who are scamps, but Beverly Clearly makes a little girl about as naughty and mischievous as possible. She was ahead of her time.And poor Beezus.....poor perfectionist, uptight Beezus. Oddly enough this first book is HER book, but she got edged out AGAIN by her annoying little sister and this eventually became the first book in the "Ramona" series....not the first book in the "Beezus" series. LOL She is probably in therapy now. Yet another one of those books where everybody smiles at the brat and says: "Well, they'll grow out of it naturally." without offering any discipline to help the poor brat. Very annoying and not recommended. As a kid, I used to devour Beverly Cleary books and the Ramona series was no exception! I recently found a copy of Beezus and Ramona at the local used bookstore, and I picked it up to relive a bit of my childhood. As a child, I was drawn to the zest for life that Ramona brought to the page. However, on this go around, I found myself identifying with sweet, lovable Beezus. Her intelligent and quiet demeanor is such a contrast to that of Ramona's. 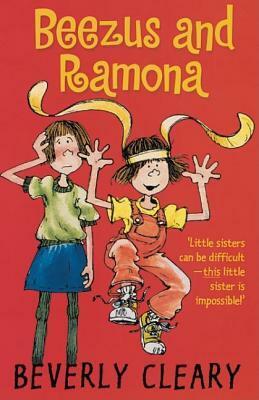 I now have a younger sister and she is a lot like Ramona, so I can definitely see why Beezus gets so exasperated with her so often. This is a timeless story about the differences between sisters and the love that they share even when they don't like each other. This book, while heavily featuring Ramona, is more about Beezus and is told from her point of view. I'd recommend this book to young girls who have sisters that they feel like they just can't stand. It's relatable and timeless. Even though this book is over 50 years old (can you believe it! ), it stands up to the test of time and is a standout volume of children's literature. Bottomline: Started to read this to my 5year old.... neither of us were impressed, so we stopped.I remember reading this series when I was little... and my daughter loves (and very much relates to Ramona's antics in) the movie remake that came out a few years ago... so we were both very excited about starting this book. But not very far in (maybe half way through the 1st chapter), my daughter just couldn't seem to get interested... for which I was thankful - because it just wasn't settling right with me, either. See, we are very much about respect in our home - no matter your size... and frankly, I found myself *disgusted* with the way they talked & treated Ramona just for being the "little kid/sister". Now I understand kids can be challenging and push your buttons. I have a very high-energy, spirited, imaginative little being, that is always elbow deep in some sort of "project" or "experiment"... but the overall tone of constantly being annoyed & bothered by *family* - and esp when it came to dealing with/handling the antics of the littles - does not fit into our family's philosophy, and is not the kind of model I need to set before my impressionable little person. As a read-aloud, young children will relate to Ramona, and older, independent readers will feel Beezus's pain. This is my favorite Ramona book, because of the episode with the library book (I'm a librarian, see). Ramona, being only four, colors in the steamshovel book Beezus checked out for her from the library, and they have to pay for it. When the librarian stamps the book "Discarded," and prepares to hand it back to the girls, Beezus sees the danger just in time. If they give the book to Ramona, she will learn the lesson that any book you want to keep from the library, all you have to do is color in it! The book is given to Beezus, not Ramona, and a crisis is narrowly averted. My own once-annoying little sister ran her first 5K this morning and texted me afterward to tell me she had done it, how happy and accomplished she was feeling. This is the perfect book to read on a day when I am thinking about her, since we certainly weren't always the sort of friends we are now. I can't believe this book has been around since the 50's (aside from the fact that 9-year old Beezus spends her time playing checkers and making potholders). Its wisdom is contemporary and, dare I say it, healthy: You won't always love your family members in every moment. It's OK to admit that.These books are good stuff. مادر به آرامی فر اجاق را خاموش کرد، دستگیره ای برداشت، عروسک نیم سوخته و بقیه کیک را از داخل فر بیرون آوردبئاتریس خشمگین گفت: رامونا جرالدین کوییم بی! تو... وحشتناکی! جدا وحشتناکی ببین چه به روز کیک تولدم آوردی!؟رامونا اعتراض کرد: خودت به من گفتی خیال کنم گرتل هستم! خب...مگر گرتل ، جادوگره را توی آتش هل نداد؟خواهر کوچیکم عاشق مجموعه راموناست . من برای پیدا کردن راز این همه علاقه، به قفسه کتاباش دستبرد زدم و نه تنها پشیمون نیستم بلکه میخوام این کار رو واسه بقیه جلدهای رامونا هم تکرار کنم.شیطنت ها و خوشمزگی های رامونا خنده به لباتون میاره. I remember reading some, not all, of the Ramona Quimby series when I was a kid. I was delighted when Isabelle told me that Beezus and Ramona was the "read aloud" book at school - which means her teacher reads it aloud during snack time and after lunch.I really love this series! I have as much fun reading these books to Isabelle as Isabelle does listening to me read them. Beezus and Ramona introduces us to Ramona, and as a mother, I feel better just knowing that someone - Beverly Cleary! - seemed to understand what it's like to parent a difficult child like Ramona. It made me feel not so bad about my own kids' misbehavior. :P I like that it highlights the relationship between two sisters - they love each other, of course, but they don't always like each other, and that's okay.From a kid's standpoint, Isabelle says she likes this book because when Ramona wants to get a library card, she tries to sign her name as a series of i's and t's. Yes, this is what Isabelle loves about this book! Clearly, Beverly Cleary understands children! She gets inside the head of Ramona and gives us a peek of what might be going through a child's mind. She shows us that even when Ramona misbehaves, there is some kind of reason for her behavior that is logical to a child. July 2017: I just finished reading this book aloud to my almost-three-year-old and I can see so much of him in Ramona. She's the perfect depiction of a young child, the way their mind works, the questions they ask, the way they interpret things, the trouble they get into. I'd forgotten that this book is actually told from Beezus's point of view, but Quinn still really enjoyed listening to the story. I wasn't sure if he'd actually engaged with it and pay attention, but he did. I'd completely forgotten about the ridiculousness of the chapter where Ramona invites everyone she knows to an impromptu party, or when she acts out Hansel and Gretel, so it was wonderful rereading them. We don't actually own all of the books in the series, so I'm going to have to get hold of the next one as Quinn is demanding "more Ramona stories". Възмутена съм! Аз съм направо въмУтена и огОрчена от факта, че детството ми е било лишено от тази велика поредица на Бевърли Клиъри! Че не съм имала толкова голямо разнообразие от вече измислени пакости,които да пресъздам в домашни условия.Чувствах се толкова неразбрана, а сега!! Сега виждам, че съвсем не съм сама - аз съм една истинска пораснала Рамона, която само се чуди какво пакост да извърши.Утешава ме единствено факта, че поне сега тази поредица попадна в ръцете ми. Ако беше закъсняла с още някоя или друга годинка, не знам как бих го преживяла! First in the Ramona Quimby middle-grade readers fiction series and revolving around a misbehaving younger child.NOTE: Beezus and Ramona supports the Common Core standards…if that’s important to you.My TakeThis is a handy tale for those siblings who are the older sister (or brother) and that hate-hate relationship between siblings that turns into funny stories when you’re old enough. Well, actually, I suspect this is more useful to the parents who are dealing with older kids who are angry and/or irritated with younger kids. It’ll give you some ideas on how to deal with it…and with that need for attention.I’m having a love-hate relationship with Ramona. I love that she’s adventurous and wants to try everything. I hate that she’s so naughty and demanding! Wait’ll you read the bit about the library book!! I wanted to smack her! I did, lol, love how Miss Evans handled it *more laughter*LOL, yep, been there, tried to figure that out:”Ramona’s pictures, in fact, were so full of imagination that it took even more imagination to tell what they were. "It’s a series of vignettes with Ramona acting up throughout the events of the day: going to the library, walking down the street, temper tantrums when she doesn’t get her way or no one is paying attention to her, the impromptu “party”, wanting to be read to...from the same story...over and over, and more.Cleary uses third-person point-of-view from Beezus' perspective, so it's easy to see her points. And one point that struck me was that it is important to try and spread the compliments amongst all the kids! As for Beezus' frustrations in her art class? Yep, I totally identify with that *laughing (NOW)*In the end, I can see Mother’s point, but Ramona needs a good smack-down!The StoryOhh, why does Beezus have to have a sister, especially one with such a wild imagination, a disregard for order, and an appetite for chaos!Beezus knows she should be responsible and…sigh…love her sister (she knows she ought to). But Ramona makes it so hard, especially when Ramona practically ruins Beezus's birthday party.The CharactersRamona Quimby is four years old and a major pain for her nine-year-old sister, Beatrice “Beezus”. Bendix is Ramona’s favorite doll. Ralph is her imaginary green lizard. Mother is Dorothy. Aunt Beatrice Haswell is the fun sister who teaches fourth-grade and drives a convertible. Beezus wants to be just like her!Henry Huggins lives in the next block and is friends with Beezus. Ribsy is his dog.Mrs. Wisser is a neighbor who lives down the block while Mrs. Kemp is a neighbor with two children: Willa Jean and Howie. Susan is one of the party guests. Miss Greever is the grown-ups’ librarian. Miss Evans is the children’s. Miss Robbins is the art teacher. Wayne is a naughty boy in Beezus’ art class while Celia is usually quite good. Howie was naughty in the sandbox.The Cover and TitleThe cover has a warm white background with the child actresses pictured on the left side of the cover. Sigh, you can immediately understand Beezus’ frustrations with Ramona when you catch sight of the “paint!” handprints on Beezus’ white V-neck sweater and blue jeans. The title and author’s name (about half the title’s size) are to the right of Beezus’ face in a deep purple using a quirky combination of capital letters and lowercase set all a’jumble.The title is who the focus is on, Beezus and Ramona. I know I read some of the Ramona books as a child but I don't have particularly strong memories of them, so listening to the audiobook was an interesting experience. Stockard Channing narrates this Listening Library edition and I was disappointed with the results. I really enjoy Channing's film and tv work, but the narration just didn't work for me. Her children's voices were either whiny or outright obnoxious which makes it hard for me to decide how much of my dislike of Ramona was the writing and how much was the narration. I had always remembered Ramona as being high-spirited and mischievous, but she's out and out badly behaved here, definitely a brat. I just recently read a comment from someone that they aimed to be a parent like one of the Quimbys and after listening to this, I found that amazing. Ramona is allowed to behave terribly and wiggle out of consequences through much of the book and what finally causes her parents to quite firmly put their feet down is when she mixes jelly with her mashed potatoes - a very minor thing compared to the temper tantrums, wastefulness of the apples episode, or the destruction of a library book. There are also some things that I think date the book significantly. The whole concept that Beezus and Ramona walk themselves to the library, or that four-year-old Ramona is expected to play by herself in the sandbox with no supervision while Beezus is in art class, even the embroidering of the pot holders for Aunt Beatrice all set this in a time that will be unfamiliar to kids now. I wonder if I would have liked this more with a different narrator or reading it in standard book format and I'm certainly interested in reading at least one more to see if they're more like what I half-remember. Also, the whole bathroom/hair washing thing is completely foreign to me - apparently the Quimbys only have one bathroom (not unusual) but they wash their hair in the sink which indicates to me that they don't have a bathtub or shower at all (this is what is unfamiliar to me). Also apparently they don't do it that often since it's made into a rather large event in the course of the story. That's just a very different dynamic from how I've been lucky to be able to live and it gave me food for thought. This was my 4 years first regular chapter book. We started out reading it, and then switched to listening to an audiobook during the commute to school.The thing I personally found interesting was how different 4 year olds were treated in the 1950's versus now. I found myself amazed at how much freedom a 4 and 9 year old had: Walking to the library. Going to art glass, with Ramona basically playing in the park unattended. This is amazing to me, even though I know that it echoes my own childhood. Where I was allowed to play outside by myself at age 4 as long as I stayed on the block. Or when I was allowed to take the bus to the library by myself at age 9-10. (I should point out, that this was the 80s and I lived in a midwest town, population 40,000).The other main thing I noticed was having to correct a few gender role issues. (In one scene Beezus remarks how Ramona is a girl and shouldn't be interested in construction themed books).But the part that made it all worth it, was during a scene where Ramona did something really awful and Beezus was so upset and crying, and my daughter piped up from the back seat "Momma, I'm not actually crying, but I'm rubbing my eyes because I feel really sad".And I was overjoyed, because I knew in that moment that my 4 year old got it...that empathy...that connection to characters that made me fall in love with reading.I declare Operation: Chapter Books, a definite success! When I was a child, I never read the Ramona books, because my mom thought they displayed Bad Attitudes and encouraged me to read other things instead. I never cared, but recently, I thought I should try out the classic stories for cultural knowledge and appreciation. I now have cultural knowledge and an increased appreciation for my mother's discernment. I really did not need to read this book when I was little, and would have been even more scandalized by it than I was now.This book is well-written, has an authentic childlike voice, and includes an illustration with a stuffed panda bear, but I do not like it. I cannot like it. Ramona is an absolute brat, and even though some of her antics were merely childish, her overall behavior was dreadful and her parents made little to no effort to discipline or train her through any method other than "go to you room until you want to be good." Everyone treated her like a pest and interruption, but instead of training her, encouraging her to behave, and giving grace as she grew, the family thought they should just tolerate her rebellion, selfishness, and inconsiderateness until she "grew out of it." Yeah. When she's a teenager and her rebellion has real cost, I'm sure they'll wonder where they went wrong. I have an amazing, beautiful, old copy of Beezus and Ramona that I scored at a library book sale. I adore it, and decided to give it a reread, as I haven't visited with Ramona in forever. Can you believe this--I completely forgot the first book in the Ramona series is told from her older sister's point-of-view. Ramona is only four, and while she's just as charming and adorable as usual, four is very different from the Ramona I remember (Age 8!). What I'm saying is that I appreciated and enjoyed that this story was from the pov of her older, practical sister. Ramona bounces around wearing her rabbit ears (see the book cover), scribbles in library books, busts in on an art class to draw her imaginary pet Ralph, eats just one bite out of all the apples, invites all of her friends over for a party, and does all sorts of little girl antics. Beezus is so sweet and patient, sometimes getting understandably frustrated with her little sister, but usually just showing her love for Ramona. And since we all love Ramona, that's such a sweet place to start this series that I can't wait to read the rest. I loved reading this series as a kid. Walk down memory lane...the books that began my love of reading. I loved these books dearly when I was younger. I'm delighted they hold up though my perspective is very different. I laughed and laughed and felt so bad for Beezus. I don't remember Ramona being so spirited, but she is an absolute delight. This review consists of two parts: 1. My daughter's review (she's 8) and 2. My review (I'm the Mom). These are excerpts - for the full review please visit us at www.motherdaughterbookreviews.comDAUGHTER SAYS:What I liked and disliked about it: I think I’m more like Beezus and my brother is like Ramona (sometimes), but I still like both the girls. Ramona sometimes does bad things that annoy Beezus. I like to read about the funny things that Ramona does like taking one bite out of a bunch of apples and saying “The first bite tastes the best” and inviting lots of kids over for a party without Beezus and their Mom knowing about it. Chapter 5 (The Party at the Quimby’s) is my favorite because it’s the funniest one. I like Ramona’s imaginary pet, a lizard named Ralph. If I was Beezus and I had a sister like Ramona, I would be scared to death that I would always get in trouble – - kind of like how my brother gets me in trouble. I even understand how Beezus can say that sometimes she doesn’t love her sister because I’m an older sister too.The only thing that kind of disturbed me was that the chapters were really long, but I still liked each chapter.My bottom line: I recommend this book to the other girls in my class and maybe some boys. I would definitely read more books about Beezus, Ramona, and Henry.MOM SAYS:What I liked and disliked about it: There is a reason that a book written in 1955 is still as well-loved today as it was back then. The book includes strong, likeable characters in Beezus and (even) Ramona, as well as the sympathetic Mom and Aunt Beatrice. The stories may all be centred around Ramona doing something naughty (e.g., scribbling in the library book, knocking down Beezus and Henry’s checkerboard), but the consequences are realistic (e.g., pay for the damages, apologize to librarian, and doesn’t get the book back; being sent to her room) and the moral of the tale is clear. There is always a lesson to be learned.It was really fun to read about Ramona’s antics which pale in comparison to some of the stunts pulled by characters in other middle grade book series (e.g., Ivy and Bean; Captain Underpants) and which are fairly realistic in terms of the type of trouble a girl of this age would get herself into. I didn’t feel uncomfortable with the “bad behaviour” in this book compared to these other books where some seriously nasty, malicious things take place, and where the seriousness of these behaviours is minimized (e.g., throwing worms in someone’s face; putting bubble bath in the band’s musical instrument).I love the way Beezus is portrayed and I love her honesty around the ambivalence she feels toward Ramona. Let’s face it, who hasn’t felt what I will loosely label “hatred” toward their brother or sister at one point or another? Like the time that my brother cut pictures for his school locker out of my well-loved and very worn issue of Parade magazine, my first issue purchased with my own money. Or the time he used a black permanent marker on our wood paneling to make a road for his hot wheels and was successful in blaming me for it.I’m sure we all have stories we can share of these types of moments and this is what Clearly does so beautifully in describing how Beezus comes to realize that her relationship with Ramona mirrors the relationship between her mother and her aunt – one fraught with delight and challenges, but nonetheless firmly grounded in love. This is the lesson that I’ve learned in my life and the one I teach my children – while it is perfectly normal to be angry with a loved one, it does not diminish in the slightest the love that you have for one another.My bottom line: I really like these characters and the stories. Beezus and Ramona are imperfect but so charming. They are characters who make mistakes, who experience a gamut of emotions (i.e., anger, happiness, sadness, jealousy), and who in the end accept and love each other. I would highly recommend this book and others by Beverly Cleary. Cleary writes books with strong female, male, and/or animal characters (e.g., Ramona, Henry, Ribsy, Beezus, Ralph, Maggie, and others) therefore there is a series that would be appropriate for either girls or boys. Because the chapters are quite long, I would recommend these books for 7+ years. First real classic read-aloud with almost-5-year-old. Great illustrations, hilarious stories, and real talk about feelings. I love that these books stand up to being re-read as an adult from the viewpoint of a parent of a 5-year old. They're also near timeless (other than all the parents leaving their preschoolers alone at a birthday party at someone's house without a formal invitation or oral confirmation). And the difference between this and drivel like Caillou is that, when Ramona makes a mistake, the lesson is spelled out in the book rather than a child reader having to read between the lines to figure out what they should have avoided in Ramona's place. This is definitely one of the best children's series of all times. And the author will be 100 years old this April (2016). Poor Beezus! I can definitely feel her pain as I have a little sister that is 16 years younger than me. She is constantly being annoyed by her younger sister Ramona. Ramona is a rambunctious little girl. She is always getting into some kind of trouble. In my opinion Ramona needs a good spanking. She throws tantrums, slams doors, even wonders off from home. Beezus, her older sister is tired of Ramona annoying her, and always getting her way. She feels bad because she doesn't always like Ramona. In the end she realizes that it's ok not to always like her sister, and that one day Ramona will grow up and everything will be great between them. Stockard Channing narrates these audiobooks, and they are a treasure! It's funny to reread this book after so many years. It was like remembering a language I used to speak with its simultaneous familiarity and fogginess.What kind of blows my mind is that I was (and am) a total Beezus, with my desire for quiet time for needlework and board games, and my belief in the sanctity of my library card, and Ramona-ish types really get to me. I have always felt stressed out by really high energy characters that many kids gravitate to, like Tigger, or Animal, but I always loved reading about Ramona. I don't know why she's the exception, but I love her. I have been reading all of the Ramona books, in order, to my oldest son for the past couple of months. What is amazing to me is how much I remember from these books, and I haven't read any of them for 30 years. Beverly Cleary is amazing. She's so good at seeing the world through kid and grown-up eyes at the same time. And she's so funny. Hearing my son laugh out loud every time Ramona does or says something pesky or silly is music to my ears. We are now on the last Ramona book (Ramona's World) and I will honestly be sad when we are done with it.